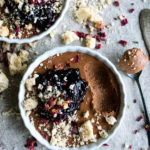 I can’t get over how good this Dark Chocolate Mousse is…topped with sweet berry wine jam and buttery pieces of hazelnut shortbread! Happy Valentine’s Day, everyone! 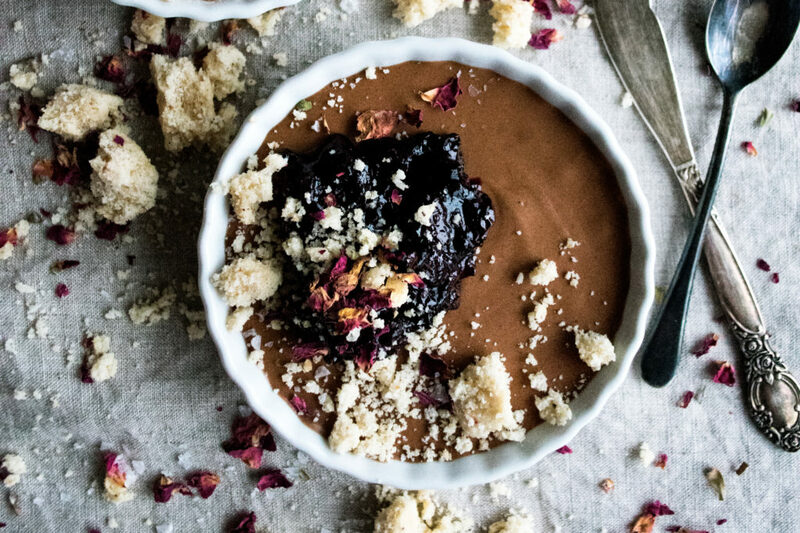 I made this dark chocolate mousse over the weekend (and snacked on way too much of it while watching the Olympic figure skating team event), and am so excited to be sharing it with you for Valentine’s Day! I knew I wanted to make a mousse, but needed a few components to make this dessert extra special. 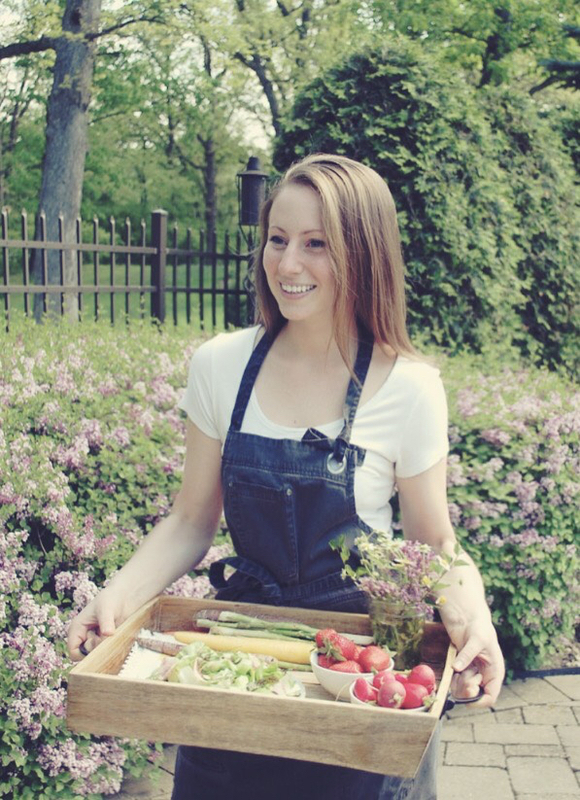 That’s where the berry wine jam and hazelnut shortbread come in. The berry wine jam is sweet and has this intensely rich flavor from the red wine. I could basically eat it by the spoonful! The dark chocolate mousse works perfectly with it, and I highly recommend making sure to get a little of both in each bite. Then there’s the hazelnut shortbread. I started with a base shortbread recipe (see these heart-shaped cookies from last year) and then added some freshly ground roasted hazelnuts. This gives the shortbread a really fragrant, nutty flavor. I almost didn’t have enough shortbread to use with the mousse because I was eating it warm straight from the oven! It’s buttery and stays really soft because I bake it in a baking dish, creating the perfect texture. I break apart the shortbread once its cooled, but leave the pieces fairly large so you can really get the shortbread effect. And then paired with the dark chocolate mousse and berry wine jam? SO GOOD. I really ate way too much of this, but I couldn’t help it. The flavors and textures of this recipe are everything I absolutely love. 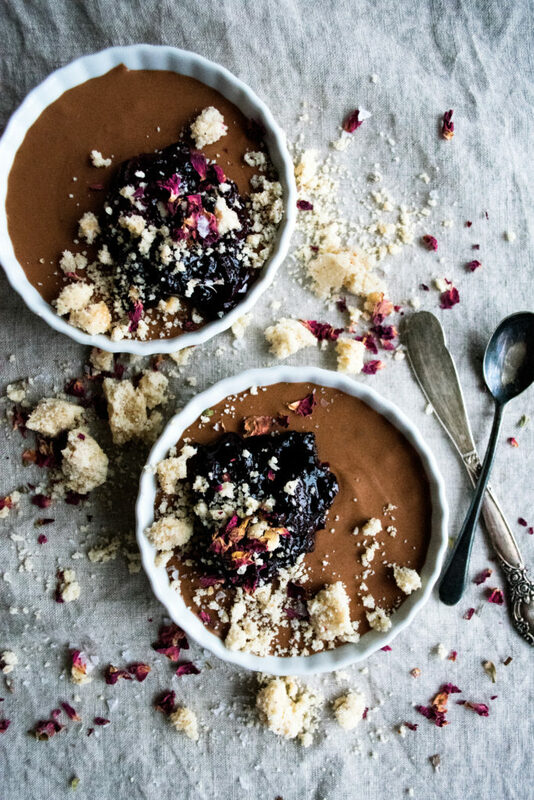 So, if you’re cooking at home for Valentine’s Day, I definitely recommend picking up these ingredients and whipping up a very special mousse for dessert!! Preheat the oven to 400°F. Line a sheet pan with foil. Spread the hazelnuts evenly onto the pan. Roast the hazelnuts for 10 minutes. Let cool slightly. When still warm, aggressively rub the hazelnuts with a dish towel to remove the skins (there will still be some skins left on; this is fine). Fully let the hazelnuts cool. Process them in a food processor until they resemble fine crumbs. Lower the oven temperature to 350°F. In the base of a stand mixer, combine the butter and sugar. Using a paddle attachment, cream the butter and sugar together until smooth and fluffy. Mix in the vanilla. Gradually add the flour and salt, mixing on low speed first and then faster once all the flour is added. Scrape down the sides of the bowl as needed. Add in the ground roasted hazelnuts and mix just until incorporated. Grease a 9”x13” baking dish with butter. Press the shortbread mixture into the dish, creating an even, flat layer of shortbread. Bake for 12-13 minutes until set. Let the shortbread cool. Crumble into medium-size pieces. In a saucepan, combine the strawberries, blueberries, sugar, and red wine. Bring the mixture to a boil over medium-high heat, stirring so that the sugar dissolves. Lower the heat to a simmer and cook for about 30 minutes until the berries have burst, the wine has reduced, and the mixture has thickened into a jam-like consistency. Add the cream to a stand mixer. Using a whisk attachment, whisk on medium speed until foamy. Add the sugar. Continue to whisk, increasing the speed as needed, until soft peaks form. Transfer the whipped cream to a bowl and chill in the fridge. Rinse the stand mixer bowl and reserve for the egg whites later on. 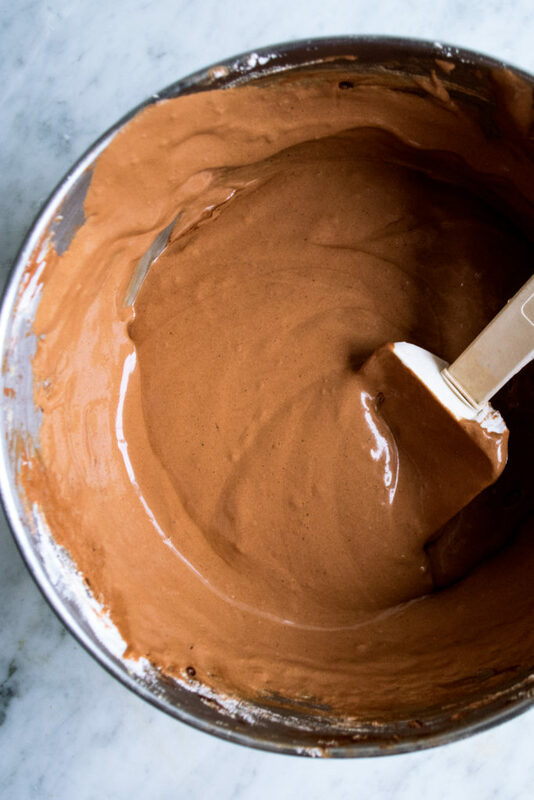 Place the dark chocolate in a stainless steel mixing bowl. Add a small amount of water to a small saucepan. Place the saucepan over medium-low heat. Place the mixing bowl on top of the saucepan (make sure your bowl does not touch the water; you can pour out some water if needed). Stir the chocolate until melted. Remove the chocolate and let cool. Add the egg yolks, sugar, and salt to another stainless-steel bowl. Place over the saucepan and whisk aggressively until the mixture is light in color and double in volume. This will take a couple of minutes. Off of the heat, fold the melted chocolate into the egg mixture. Let cool fully. Meanwhile, add the egg whites to the stand mixer. Using a whisk attachment, whisk on medium speed until foamy. Add the sugar. Continue to whisk, increasing the speed as needed, until stiff peaks form. Fold the whipped egg whites into the chocolate mixture in two batches until incorporated. Lastly, fold in the whipped cream. Spoon the mousse into ramekins or small dishes. Place in the fridge and chill for an hour or so. 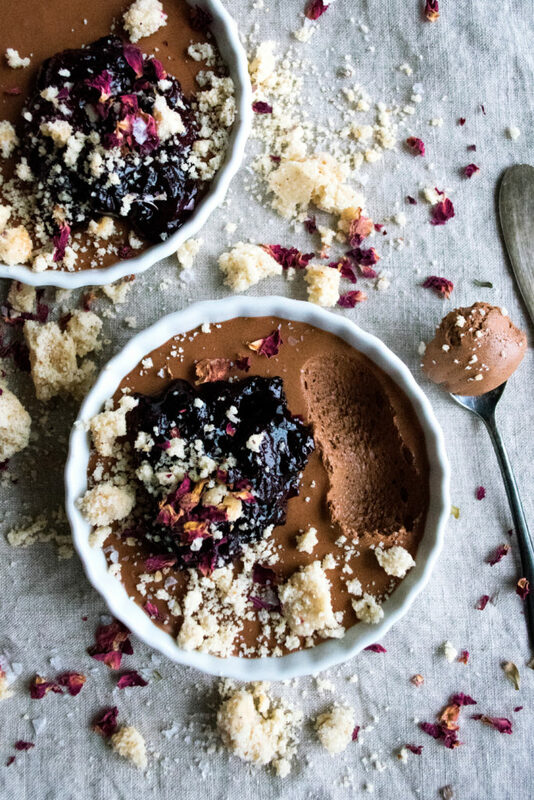 To serve, top the chocolate mousse with the berry wine jam and crumbled hazelnut shortbread. Garnish with crushed rose petals if desired. These little guys are DREAMY!! Happy Valentine’s Day to you! Oh, they certainly are, but oh so dangerous as well! Thank you so much 🙂 I hope you had an amazing Valentine’s Day! !